Until now, I have been fairly strict with my biscuit ingredient choices. I choose buttermilk, not the milk and lemon juice substitute many swear by. Butter, not margarine. White Lily flour, not store brand. But there are times you can’t get to the store but you still want biscuits, so what do you do? The fact is that there are many more variations on biscuit ingredients and recipes than there are readers of this blog, so there are a lot of answers to that question. I decided to test one out that I have not heard anyone else mention: powdered buttermilk. This nifty little invention can be found in the baking aisle of your local grocery store – where evaporated, condensed, and powdered milks are to be found. Directions for use are on the side of the container. Basically, a few tablespoons of the mix are added to your dry ingredients. Then water or some other kind of liquid is added at the appropriate time. For my experiment, I decided to use my banana biscuit recipe as my base. I used the appropriate amount of powdered buttermilk and mixed it in with the flour. Then I chose almond milk as my liquid, because that is what I had on hand. Besides, I figured the vanilla flavor in the milk would just be a bonus. Otherwise, I pretty much followed the recipe. Of course, I also used some of the dough to make little chocolate filled pockets because, well, why not? This was all about convenience. I had all of the ingredients on hand: the overripe banana, almond milk, and powdered buttermilk. The thing that surprised me was when I added the wet ingredients to the dry. The dough was initially too dry, so I added a little more liquid. Then it seemed like the dough got really wet, really fast. I wondered if there were some kind of chemical reaction with the powdered buttermilk and the liquid that caused this. Do any of you readers know? Delicious! We enjoyed a few of them and then the rest were bundled up and left with a friend who was dealing with a family crisis. At the end of all of my recipes, I say “Share with someone you love,” so that is what I did. She reported back that they did not last long in her household. Lately, I have been waking up at 4:30 am on a regular basis, knowing that attempting more sleep is futile. There is just so much to do. I’ve been sorting through everything in my house, figuring out what to throw away or give away, what to put in storage, and what to move to M’s house. He has been doing much the same, making room for me and my things. I do try to sleep more but generally give up at 5:30 or 6 and use the extra morning time to get some things done. On this particular morning I decided to make biscuits with my extra time, because that’s what you do when you should really be packing. I had a bag of locally produced whole wheat flour from Shelton Farms that I had been wanting to try. I noticed that it was low in protein, like White Lily. They say that you want lower protein flour (2 g/serving) for biscuits and higher protein for breads, so this seemed perfect. I also had a Granny Smith apple in the fridge that needed to be eaten. I had been wanting to experiment with shredding apple into biscuits ever since I made the Paige’s Family Biscuit recipe. That one seemed to benefit from the larger chunks of apple in my second making, but I liked how the smaller pieces sort of disappeared into the biscuit in the first making, becoming part of the biscuit and not just an addition to it. Finally, I have been following a very low tech biscuit making process for some time now. There is something very satisfying about that. Getting your hands into the flour, rubbing the butter. But I do happen to have, and to love, this wonderful food processor and have wondered if and how it might be of use in the biscuit making process. There you have it – the perfect storm of flour, fruit, and appliance came together to inspire these Whole Wheat Apple Cinnamon Biscuits. It might be difficult to find a whole wheat flour that is low in protein. If that is the case, you may want to try using half of a regular WW flour and half low protein white. I’ve also heard of mixing in part cake flour to add the lightness. If you try one of these options please let me know how it turns out! I also added some ricotta cheese to this biscuit and believe that, and the grated apple, are what makes this biscuit so moist. They turned out just as I had hoped they might. Nutty, moist, flaky, slightly sweet, lightly spiced. Perfect warm or cool, with butter or without. Seriously, you could throw one of these into a lunchbox and it would be a perfect snack – no reheating required. I took a couple into the office to share with coworkers and they are still talking about them. I only baked a few in the first batch and those were gone in hours. The remainder were cut out and put onto a cookie sheet to freeze, uncooked. After freezing, they were bagged up and saved. Later I took them out of the freezer, placed them close together on a parchment lined baking pan, and baked them at 375 degrees for 25 minutes. I did not thaw the dough first. Note that is a lower temperature and longer time than if the dough were fresh. I brushed a little almond milk on them and sprinkled some cinnamon sugar on top of that before putting them in the oven. The frozen biscuits baked up perfectly. My mother came over to help pack and it was the perfect thing to share with her. Remarkably, there were still a few biscuits left after that, so I got creative with toppings and constructed this biscuit sandwich. If you want to make something similar, just slice the biscuit in half, put a nice slice of Brie cheese on the bottom of the biscuit, add a layer of cooked bacon and a few very thinly sliced apples, another thin layer of brie, and put the top half of the biscuit back on the stack. Warm the whole thing in a 375 degree oven for about 10 minutes – or until you notice the cheese getting nice and melty. Yum! >>> Click here for printable biscuit recipe. Heat oven to 425 degrees. Cover cookie sheet with parchment paper. Put the first six dry ingredients into a food processor and pulse for 20-30 seconds to blend thoroughly. Add butter to dry ingredients and pulse food processor 15-20 times until butter has been incorporated and the bits that remain are about the size of a pea. Add shortening to food processor and pulse 15-20 times until shortening has been incorporated and the bits that remain are about the size of a pea. Transfer to a medium bowl. Using the shredding attachment of the food processor, shred the apple. Add to the dry ingredients and mix to coat the apple and break up shredded pieces so that they are loose in the mixture. You do not want them to all stick together. Combine vanilla, ricotta, and buttermilk in a small bowl. Whisk together. Make a well in the center of the dry ingredients and add the buttermilk mixture. Mix quickly with spatula or hands, turning bowl and gently scooping the dry ingredients into the wet. Add more buttermilk, if needed, to make dough moist but not too wet. Sprinkle flour onto countertop or pastry board. Dump dough out of bowl onto flour. Sprinkle flour onto dough and rub onto hands. Press dough together and flatten to about 1/2 inch. Fold dough in half. Repeat three times. A pastry scraper can be really helpful to lift up the dough. Keep adding a little flour as needed to keep the dough from sticking. Press out to about ¾ of an inch high. Using a biscuit cutter or tin can, cut out biscuits. Transfer to cookie sheet. Place biscuits close together on cookie sheet, or 1 inch apart if you want crispier biscuits. Press scraps together and cut out remainder of biscuits. Put cookie sheet in oven and bake for about 20 minutes, until tops of biscuits are slightly browned. If you wish, take the biscuits out of the oven a couple of minutes before they are done and brush the tops of the biscuits with butter, sprinkle with cinnamon sugar, then return them to the oven. Remove from oven, let rest a few minutes, then break apart and eat! Share with someone you love. What to do with leftover Banana Biscuits? I was alone in the house when I made them, which means, contrary to what one might think, I did not eat them all. I also happened to have a supply of leftover ham. It would not have occurred to me, under normal circumstances, to combine ham and banana. But something told me that it just might work. From that point on, I tried not to think too much. Cooking is sometimes a little like sports – you have to get in the zone. Let your senses do the work – smell, taste, feel …. bake. Sometimes, if you are lucky, there will be magic. This was one of those times, if I do say so myself. The hint of banana, combined with the smoky ham and sweet/tangy mustard, is perfect. Make some of these for your next party or book club or just a leisurely weekend breakfast at home. >>> Click here to download a printable version. Heat oven to 400 degrees. Cover cookie sheet with parchment paper. Scramble eggs and divide into six parts. Do not overcook the eggs. Slice biscuits. Place bottoms of biscuits close together on parchment paper. Combine mustard and onion powder with 2 T. of butter. Spread mustard mixture on both tops and bottoms of biscuits. Cover bottom halves of biscuits with half of swiss cheese and all of the ham. 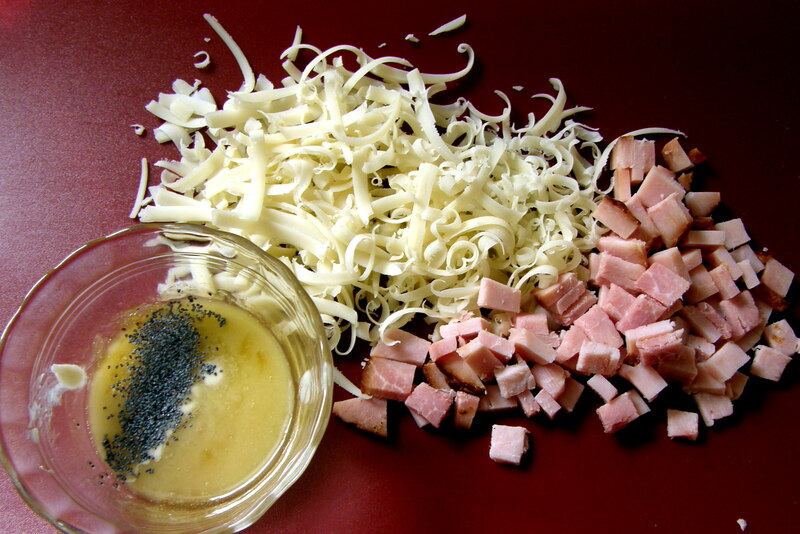 Spread scrambled eggs over ham. Put tops of biscuits on top of cheese. Brush tops of biscuits with remaining 2 T. melted butter mixed with poppy seeds. Bake for 12-15 minutes or until cheese melts. Remove from oven and run a knife between the biscuits to make sure they are separated. Share them with someone you love. “Wait, there is a National Biscuit Month?” you ask. Yep. That’s what I hear and I’m going with it. So … I’ve created a list of the top five biscuit recipes I’ve tried since starting this blog. If you would like to make some biscuits and don’t know where to start, pick one of these and you can’t go wrong. Almost all of them are some combination of savory and sweet, with a little spice thrown in for good measure. They are in no particular order. So far, I’d have to say that this is my favorite recipe for “plain” biscuits. They are so light and fluffy and slightly tangy. Perfect by themselves and also an excellent vehicle for any herb or spice that you might want to add. They also turned out to be the perfect cake to use for Strawberry Shortcake with sweetened whipped cream. This is the biscuit that completely redefined bacon for me. Plain bacon is good. Really good. But bacon that has been cooked with black pepper and brown sugar? Transcendant. Then you mix that into a biscuit? Crazy good food. That’s what it is. I love how the creator of these biscuits was so generous in sharing the recipe with me. 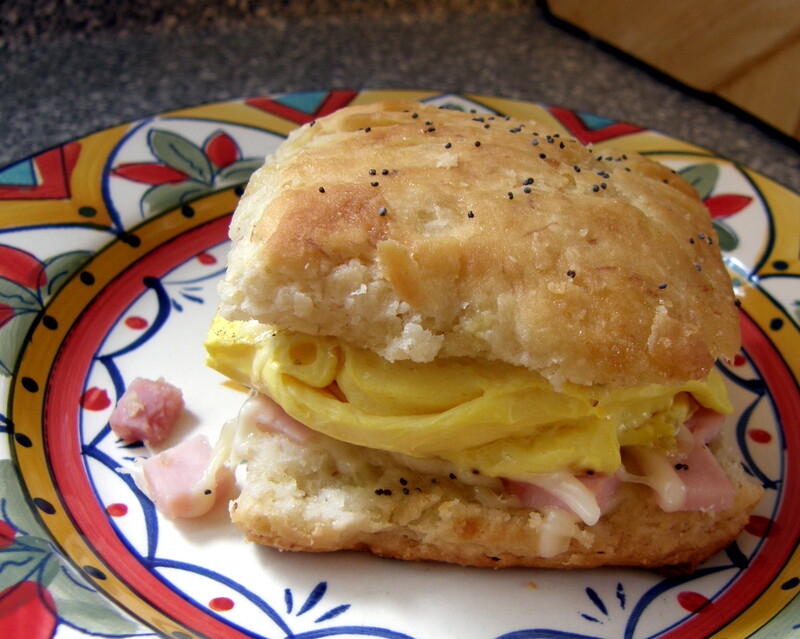 These biscuits are mostly savory, with a bit of sweetness from the apple. Which is also a bit tart. Wonderful blending of flavors and textures in this one. I may have to make another batch while I still have some fresh basil in the garden. These are sweet, but not too sweet. So moist with the pumpkin, and slightly spicy, and a gorgeous color. Something for all the senses. I also love the way the sweet and spicy played off of the fine sausage that I paired with it. That made these magical. Because sometimes you just need Buffalo flavored . . . anything. These are a unique and tasty way to fulfill the craving. Now, go, make some biscuits, and let me know how they turned out. And, as always, share them with someone you love.